- I remember my mum hysterically screaming at the telly when the accidental announcement was broadcast. - I remember my parents shipping me and my youngest brother off to my nan so they could drive down to Berlin and get their own piece of the Wall from the west side of it. - I remember crossing over into West Germany for the first time in the most traditional East German car you can imagine, being received on the other side sorta like the US celebrated their war heroes’ homecoming. - I also distinctively remember asking my parents for the (as it turned out it was the last) elections why they weren’t voting and them saying that it made no difference as that one party was gonna win either way. None of this stuff made sense when I grew up. I was only 6 years old. BUT I REMEMBER IT and I remember my imaginary light bulbs practically BURSTING when I started learning about this part of Germany’s history at school. Being a teacher (mum) and musician (dad) couple, it meant that in the face of communism, the state considered them both very able to spread anti-communistic world views. They were constantly under surveillance by the Stasi. They felt trapped and controlled with no thinkable way out. My mum actually was in Berlin on 13th August 1961 when the German-Soviets decided on putting up the Wall, and she was in West Berlin trying to get back into East Berlin and almost not being allowed home – at the age of 11. Now it’s 50+ years later and everyone can freely move around not just within Germany, but in the world, which was unthinkable for decades. 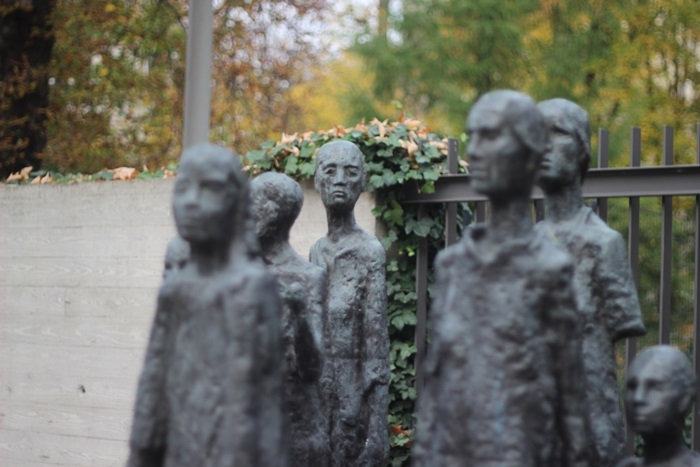 This silencing group of figurines is the memorial for Berlin’s first Jewish Elderly Home, which was turned into a place where 55,000 Berlin Jews were sent by the Naxis before they were “relocated” (as the Nazis put it!) to concentration camps. I love that Berlin and Germany embrace this horrible, horrible part of its history, reminding and warning everyone to stop history from repeating itself. Why am I showing you a picture of a very withered front of some random building? Well, because it’s not withered. But it’s what I thought at first too, always did, until my friend opened my eyes on my last trip to Berlin: these are bullet holes! This is some random street somewhere off the centre, at least 20min walk away from the Wall and even longer from the Bunker. And yet this random building’s front is riddled with hundreds of bullet holes. And it’s not the only building in this street or in Berlin. 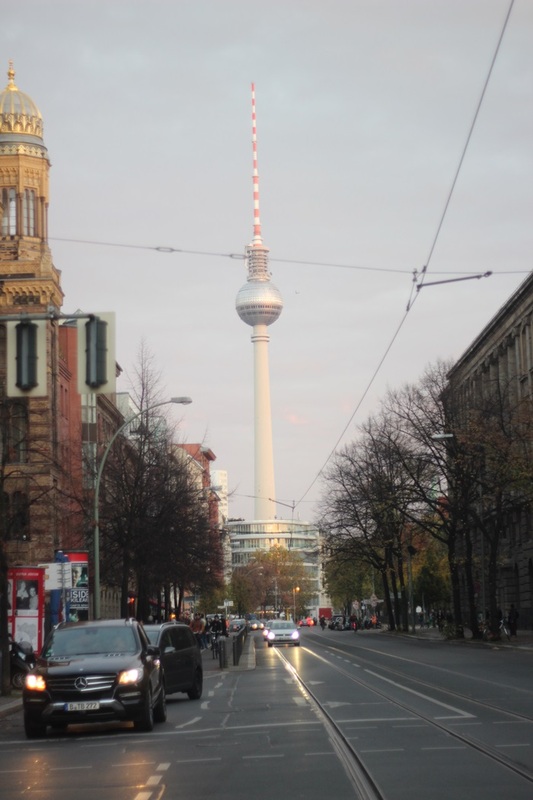 Berlin’s TV Tower makes Berlin’s skyline. It’s like NYC’s Empire State Building or Paris’s Eiffel Tower or Sydney’s Opera. You see it and you know it’s Berlin. But what a lot of tourists don’t know is that it was built by the German-Soviets to celebrate its power and capabilities in the world. It was commissioned by the same guy that decided to build the Berlin Wall. And it’s still here. 20+ years after reunification of East and West Berlin, after the evil communist enemy was defeated, it’s still here. It could’ve been knocked down. But again, Berlin doesn’t hide its history. This is why I love Berlin. It stands up to its history. It embraces it. It shows, displays and educates. It silently warns. ick will dit auf deutsch, ehy! - Ich kann mich daran erinnern, wie meine Eltern mich und meinen jüngsten Bruder zu meiner Oma abschoben, damit sie nach Berlin fahren konnten um sich ihr eigenes Stück Berliner Mauer zu holen – von der Westseite natürlich! - Ich kann mich auch noch ganz stark dran erinnern, dass ich bei den wohl letzten Wahlen noch gefragt hatte, warum sie nicht wählen gingen und sie sagten, dass eh immer dieselbe Partei gewinnen würden. NICHTS davon ergab irgendeinen Sinn als ich klein war. Ich war ja auch nur 6 Jahre alt. Aber ERINNERN tu ich mich! Und ich weiss noch wie mir die Lichter aufgingen, als ich dann diesen Teil im Geschichtsunterricht hatte. Da meine Mutter Lehrerin und mein Vater Musiker war, waren meine Eltern laut Kommunisten eine Gefahr, weil sie beide genug Möglichkeiten hatten um andere Weltbilder als erlaubt zu vermitteln, und dementsprechend waren sie immer unter Überwachung von der Stasi. Sie fühlten sich eingesperrt und kontrolliert mit keiner Hoffnung auf Erlösung. Meine Mutter war übrigens in Berlin als am 13. August 1961 von den Deutsch-Sowieten entschieden wurde eine Mauer zu bauen .- und sie war in Westberlin und kam fast gar nicht mehr nach Hause! Und das mit 11 Jahren. Und jetzt sind es 50 Jahre später und man kann sich nicht nur innerhalb Deutschlands sondern der ganzen Welt frei bewegen – was für Jahrzente undenkbar war. 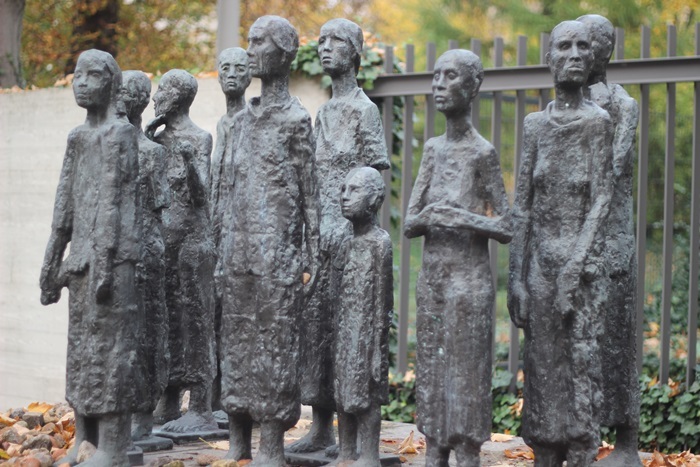 Diese Gruppe von Figuren sind ein Denkmal für Berlins erstes Jüdische Altersheim, was von den Nazis dann umgewandelt wurde in eine Sammelstätte, von wo 55,000 Berliner Juden nach und nach in die Konzentrationslager kamen. Ich liebe es dass Berlin und Deutschland diesen schrecklichen Teil ihrer Geschichte zeigen und alle dran erinnern und drum bitten und warnen, dass sich solche furchtbaren Dinge nie wieder wiederholen. Warum zeig ich euch ein bild von einer sehr verwitterten Fassade von irgendeinem Gebäude? Weil es nicht verwittert ist. Aber das habe ich am Anfang lange auch gedacht. Bis mein Kumpel mir beim letzten Berlinbesuch die Augen geöffnet hat: es sind Schusslöcher! Dieses Haus befindet sich in irgendeiner unwichtigen Strasse, die mindestens 20 Minuten zu Fuss von der Mauer entfernt ist und noch weiter weg vom Bunker. Und trotzdem ist die Wand dieses Gebäudes total durchlöchert mit hunderten von Schusslöchern. Und dies ist bei weitem nicht das einzige Gebäude auf dieser Strasse und in Berlin, dem es so geht. Berlin könnte diese Seite von sich verstecken, diese Löchter zumachen und so tun als wenn alles nicht passiert wäre. Aber das macht sie nicht. Lieber mahnt sie still, auch wenn sie vielleicht nicht jeden, der an solchen Sachen vorbei geht, mit ihrem stillen Mahnen erreicht. Berlin’s Fernsehturm ist Teil der Skyline. Er ist wie New York’s Empire State Building oder der Eiffelturm in Paris oder das Opernhaus in Sydney. Wenn man den sieht, weiss man dass es Berlin ist. Was viele nicht wissen ist, dass der der Turm von den Deutsch-Sowieten gebaut wurde um deren Macht und Fähigkeiten zu feiern. Er wurde vom gleichen Typen in Auftrag gegeben, der auch die Mauer beschlossen hatte. Und er steht immer noch. Nach 20 Jahren Wiedervereinigung von Ost- und West-Berlin und Deutschland, trotz des Sieges über die bösen Kommunistenfeinde – er ist immer noch hier. Er hätte ja abgerissen werden können. Aber Berlin scheut sich nicht ihre Geschichte zu zeigen. Und dies ist warum ich Berlin so liebe. Sie versteckt ihre Vergangenheit nicht. Sie bildet und warnt und ermahnt. Auf ihrer stillen, lauten Art. Interesting article I enjoyed reading it. I think it was this year or last that we had an episode of the show ‘who do you think you are’ here and it went into great detail about the Elderly Home where they all got ‘relocated’ to the camps. It was interesting but so sad to watch. We were pretty sure we had German relatives on my mothers side but when I started tracing the tree this year it appears my mother has them on both her mother and fathers side. I believe they were German Jews on my grandfathers side. I wont know anymore till I carry on with the project, but so far very interesting. Loved reading this, it’s so interesting to read about Berlin when it’s not written from a touristy point of view. I noticed a lot of bullet holes in some of the back streets and more run down areas, I’d never have noticed them if you hadn’t told me to keep an eye out before we went though. Quite strange to see. it’s really weird isn’t it? you just assume that it’s the natural decay of the building – you don’t notice the symmetry of the holes, you don’t even notice it is holes. until it hits you. A very beautiful story. Thank you for sharing personal memories…I’ve visited Berlin before, but after reading this I feel more closer to the city. So interesting. Thank you so much for sharing. I wrote my dissertation on the cultural politics of the GDR, wish I had known about you and your blog, I could have asked you so many questions! 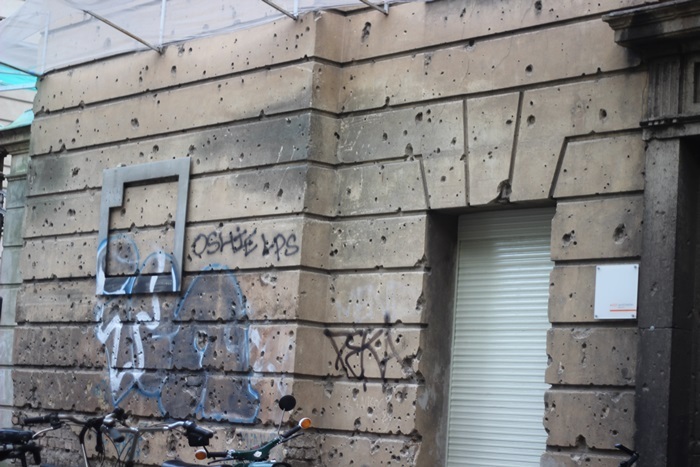 I have visited Berlin several times and what I found most striking was how everything was still raw, as your photo of the bullet hole wall sums up. Such recent history, and like you I love how it’s not hidden.